If you recall, there wasn't an official Test Kitchen ingredient posted last week due to it being the Thanksgiving weekend then. I mean, how could I try to even get some ideas churning in my and your brains when we were busy strategizing for the big turkey day? Regardless, I still did manage to put something together using an ingredient I hadn't cooked with before - almond butter! Here's a satay sauce dish that will hopefully be a welcome spin on what you may be used to having as with peanuts. Before you get up in arms with me about the naming, I know this isn't a satay dish; it's merely tofu with a sauce I would encourage to use with satay. 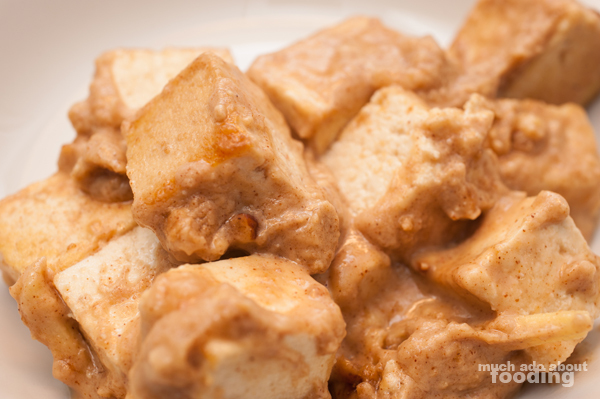 Discard water from the package of tofu and press tofu block gently to release any excess liquids. Cut into 1-inch cubes and place in a bowl. Mix with soy sauce and sesame oil. In another bowl, combine all ingredients for the sauce and mix very well. You may want to use a food processor if you prefer to make it smoother. 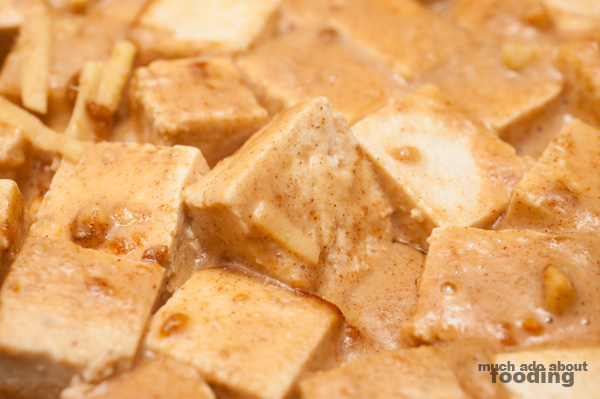 In a medium skillet on medium-high heat, add tofu and cook until golden brown on all sides. Add sauce and stir. Serve over rice and enjoy! "King Island Dairy Roaring Forties Blue is a full flavoured blue with a sweet, slightly nutty character, a rich mouth feel and good aftertaste. The rindless cheese is matured in its wax coating, which cuts off the oxygen supply, promoting its sweet and fruity flavour. The wax also assists in retaining the blue's moisture, creating a smooth and creamy texture. The cheese is named after the infamous Roaring Forties gales which frequently bring westerly winds of more than 100km per hour to the island which lies on 40 degrees latitude." Let me know what you think I should do with this by commenting on Facebook!